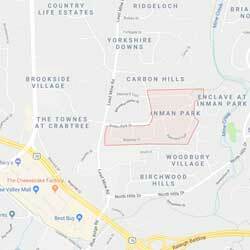 Inman Park is located in Raleigh, NC. It is a walkable neighborhood with old fashioned streetlights and beautifully landscaped common areas. There is a variety of single-family custom homes, townhomes and condos to offer options for all buyers. The homes were built from 1990-2007. Inman Park has a community pool, kiddie pool and walking trail. Perfect location! Close to everything: shopping, Raleigh greenways, Shelley Lake and major highways. Social activities planned all throughout the year make this a fun and friendly neighborhood.